In any event the magyar style of dress bodice & blouse seems to have been around for a long time in western fashion history from before WWI through the 30’s, into the 50’s and pops up beyond though in more recent decades maybe that’s when it began to be called a ‘kimono’ cut. Really I’m just making a supposition on that, don’t quote me. My blouse started with a vintage Style pattern, envelope long gone, maybe late 40’s. However the pattern is sized for a teeny-tiny person so I redrafted it to a human size for myself and made it up in kimono silk. I decided after the fact that I prefer three keyhole or tear-drop cutouts rather than two (as in this velvet dress I made a couple of years ago) so the pattern I posted has 3 keyholes. You will need to look up bias binding techniques if they are new to you as the neckline and keyholes are finished with small self bias bindings. Other than that it is an easy make and could have a collar instead of cut-outs, or a V neck or something if you just can’t face doing those fiddly bindings. It’s a nice basic shape that is wide open for creative interpretation. Thinner fabrics with some drape will work best…. even a jersey could! 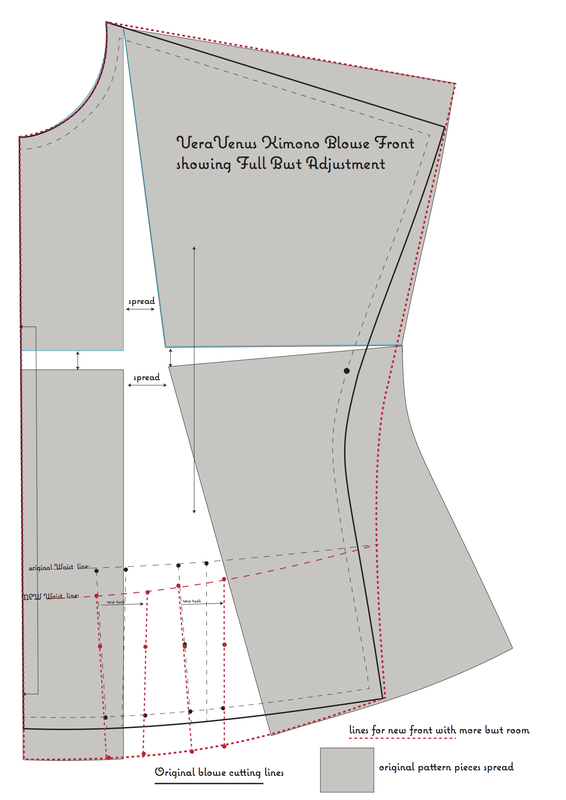 Pattern size, seam allowances, fabric amount needed etc are all included in the blouse pdf. on my VV Free page. It would be a very easy pattern to grade up or down following the Threads Grading guide link over there on the right. Though shown up there with a black pencil skirt made from my skirt drafting tutorial with bucket pockets and these little resin seahorse buttons (Is it easy to make buttons like these? I’ve been wanting to experiment with resin for ages) I have mostly been wearing my blouse with just jeans for ordinary day-in-the-studio attire. Lol, is it obvious I’m not big on taking selfies? While I’m about it here also is how to make one kind of shoulder pads from 7 inch circles. These are the ones I made for the kimono fabric Hollywood pattern dress and as I used tiny poppers to hold them in I can quickly swap them into the blouse . Not just a pretty face here, ya know! Cornish Pasty thoughts have set my stomach rumbling…. dinner time! Love this little number. It is exactly what I was looking for. And thank you too for the FBA instructions. Can’t wait to draft it. Thank you for your message! I saw your top on your blog yesterday and tried to leave a comment but from my Mac I never can leave comments on Blogspot. Very frustrating! Anyway it looks great on you, I like how you changed the neck and I’m very happy to hear the bust adjustment went well That method is one you can use on most tops. Just made this up last night in a sheer cotton/linen blend. It’s a little stiffer than I think your silk is, so maybe I’ll do it in something with more drape, but I’ve very pleased with it. Really lovely and quick in spite of the “fiddly” cut-outs. I used packaged narrow bias tape for the cut-outs as I had some on hand that was totally suitable to the fabric, just cut my own bias strip to bind the neck. Added two inches of length at the printed waistline, but otherwise made as printed. Thanks for the great new blouse! FYI I expected to be challenged by the cut outs but they were actually really easy, even at midnight! Now I want to add them to all my other projects! Fantastic Erin, that’s great to hear:) Yes, I like how quick it is to make too. Also I’ve been thinking it would work well as the top part of a dress with a 4 gore or semi circular skirt. “Midnight Makes” sounds like a good name for a series of quick to sew patterns, thanks for the thought! Interesting, that “magyar” in fact means Hungarian.. in Hungarian. Why does this type of blouse called like this (it doesn’t look like a typical Hungarian)? I hadn’t make that connection, thanks for mentioning it! Perhaps beautiful embroidered blouses from Hungary were the inspiration and a particularly fashionable import in the early part of last century ; it is very similar to the cut of 19th century (and earlier) peasant style blouses from across Europe…. just add a long rectangle to the sleeve opening, gathers at the wrist and it’s the basis for a classic rustic blouse from many countries. .
Hi Anna, I’ve added a quick diagram to my post to show how I’d go about altering this pattern for a larger bust. You could probably move the new shoulder line safely down closer to the old one even before a fabric try-out… but personally that’s something I’d work on in the fabric stage. ooh, thank you so much!! I will try this way, I can see where it’s better than what I tried before. Lovely shoulder pads. And generous of you to offer up the pattern. I am loving your kimono fabric outfits. Just beautiful. Love the fabric – I adore red. the shoulder pads look great, especially as you can make them to fit the size you need. Exactly. This method is great for pads in light weight dresses and blouses. Usually I hack up modern shoulder pads but will make my own from now on. After your last post, I just bought 4 pieces of kimono fabric on Ebay 😉 I feel like I’m going to have a hard time finding patterns with such a small amount of fabric to use, 14″ wide no less! 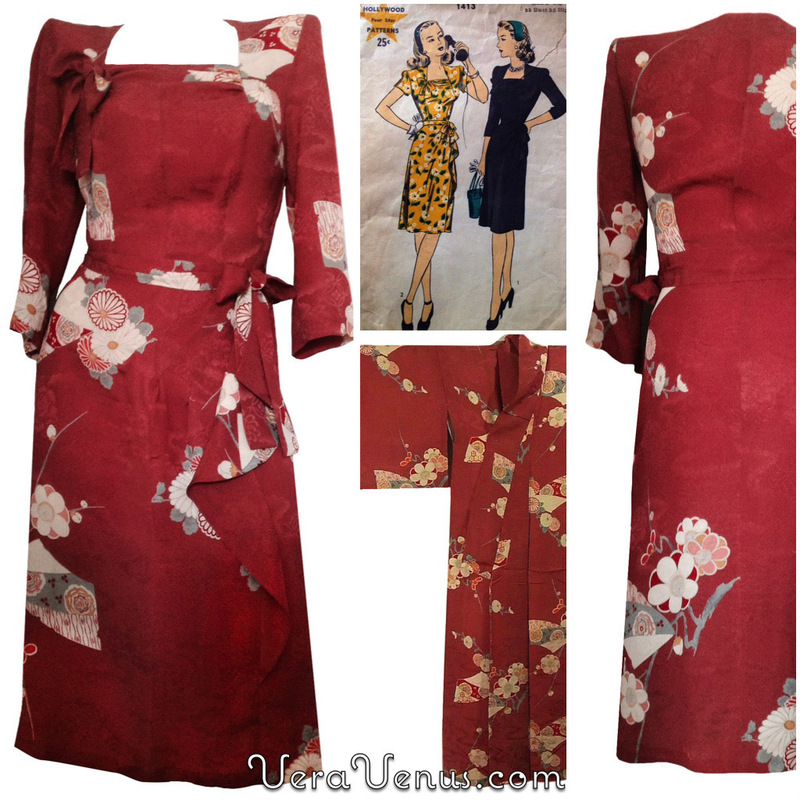 Did you find that you were able to find quite a few vintage (40’s) patterns to use because of rationing? Or did you have to get really creative with drafting your own things? Oh exciting! Well, it was a mix of careful pattern selection, a bit of redrafting and some altering -mainly the skirt patterns -to make them work. Also seaming on small pieces of fabric, literally just a couple of inches or so, was necessary in areas like the sleeve underarm to be able to get the needed width of fabric. I added centre front seams in the two bodices that didn’t already call for them and side back seams in the backs to get them to fit the fabric and get the fabric design how I wanted it placed. As to the skirts – patterns that have 4 panels, like 40’s ones, do seem to fit 14″ best though I had to make the hem width narrower all around to fit. The full gathered skirt is simply made of six of the 14″ width panels sewn together… so no pattern needed for that one at all 🙂 The peach dress was the hardest to make work especially due to the design placement. The actual pattern has a very gathered skirt all the way around and there was not nearly enough kimono fabric for that hence just the gathers at the side front and making a basic A line back skirt. I chalk marked all pattern pieces onto the wrong side of the fabric before touching scissors to cloth and must say those first cuts were nerve wracking. Good luck, I hope you’ll show what you make! I have printed the pattern, and I am so excited to sew it. I have made your Granny Pannies up a dozen times and love that pattern. I was looking for a top like this, and I do not have one in my stash. This will be perfect for the silk I have been learning to dye. I am super lucky that we are very close to the same measurements! Thank you so much! Wow, that’s fast work 🙂 Yes the shape is a perfect showcase for special fabrics. Hand dyed silk sounds lovely! I hope you will do a quicky muslin ‘test drive’ of the pattern first before using your hand dyed silk as it would be just awful if the pattern should turn out to need any adjustments (even though our measurements are similar). If the fit is kept on the loose side pulling on over your head should be fine. If you make the fit closer over the hips then an opening in a side seam or down the entire back will be needed. Hope to see your results soon! Thank you. Your top is divine. I love so mush vintage clothes,,your site make me dream.